Please join us for presentations by four of our 2018 graduate student Blum Scholars. Students will share findings from theircommunity-engaged scholarship. 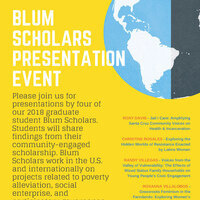 Blum Scholars work in the U.S. and internationally on projects related to poverty alleviation, social enterprise, and participatory governance.